Many prospective clients in serious personal injury and wrongful death claims ask questions about the legal fees and litigation expenses associated with their cases. 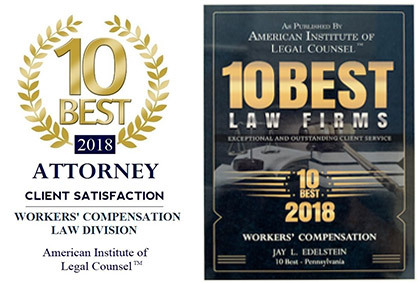 As a Philadelphia personal injury trial firm which handles serious injury and death cases across both Pennsylvania and New Jersey, Edelstein Law is very sensitive to those questions. The short answer is that in handling personal injury and wrongful death cases for individuals and families, Edelstein Law does not require any money up front from clients whose cases we accept. Rather, we evaluate the merits of a case much like one would try to evaluate a stock before investing in it. If we take the case, we charge a percentage of what we recover for the client and advance the expenses. Both fees and expenses come out of the recovery from the other side. If we lose, we absorb the time and expense invested in the case. Fees in most personal injury cases are generally one-third of the amount of the recovery (this amount is fixed with New Jersey case), with the percentage escalating if the case is tried, if there is an appeal, etc. While we prepare every case on the assumption that it will go to trial, many of the well-screened and well-prepared cases do settle before trial. Occasionally, and particularly in trucking cases, there is an opportunity to force the other side to pay the attorney fees and expenses. If we can do it, that goes directly to the client’s bottom line because we don’t charge the same fee twice. Expenses in personal injury and wrongful death lawsuits include filing fees, process servers, expert witnesses, court reporters, medical records, depositions with both stenographic and video recording, fees to treating physicians for their depositions, exhibit preparation and travel expenses. Case expenses generally run from $2,000.00 to $5,000.00 for a routine car wreck case with limited insurance coverage and up to ten times that amount, or more, for a complex commercial trucking or premises liability case. Ultimately, how a firm handles the expenses in a particular case makes a world of difference between the case’s weakness and strength-between its failure and success. At Edelstein Law, we are committed to devoting our resources in a way that will maximize a case’s value without costing our clients the proverbial “arm and a leg” in the process.